Footprints in the Butter: Review: Civilize This! I keep hoping to get pictures of my kids playing games before I write up this review, but alas... they are NOT being cooperative. So here goes... another review that isn't just for homeschoolers! Griddly Games sent Crew Members one of two games a month or so ago. Both are expansion packs or travel games for their Wise Alec family trivia game. Wise Alec covers science, history and spelling. There are now three expansion sets: Nature Nuts covers topics with animals, plants and the earth. Sports Buff covers sports history, athletes and rule. And Civilize This! does history: ancient, medieval and modern. The expansion sets can either be added on to the original game... or because of the amazing packaging, they make a fabulous travel game too. Game play is pretty basic. Roll a die (with colors on it instead of numbers) and choose the corresponding type of card. Red=Ancient, Green=Medieval, Yellow=Modern and Purple=Wise Alec. If you roll Blue, you get to pick whichever subject you want. If you roll Orange, the player to the right chooses your subject, but you get double points for answering correctly. Each card has two questions -- a 3 point question and a 7 point question. Obviously, the 7 point question is expected to be harder. Game variations for incorporating younger children include each question being worth 5 points -- but older people answer only the 7 pointers, and younger people answer the 3 pointers. We liked this variation. A quick run-down of the cards/questions. Obviously, the questions cover a wide range of topics, and there are questions that are pretty challenging for anyone. They say it is for ages 8 and up... if you have emerging or pre-readers, you may need to adapt a bit. We tended to play so that Mom read all the questions. My little two (ages 5 and 7) didn't particularly like the game, though Richard could get quite a few of the answers correct. I think as we cycle back through history the next two years, this will be a bigger hit for both of them. One caution -- there are questions about mythology. Those were among our favorites, but I know some homeschooling families are opposed to their children learning about Hercules or Anubis. There are also some really basic questions about religion -- Buddhism being founded by an Indian prince, or cows being sacred in Hinduism. The beauty of a game like this, though, is that if you really don't like a question, you can just yank it from the deck. 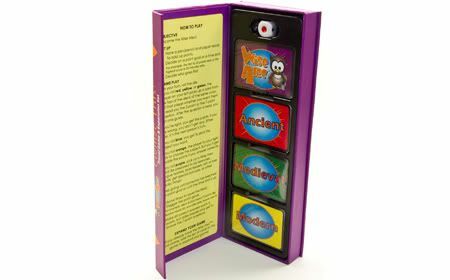 Griddly Games is available at lots of game stores, and online as well. You can see a list of retailers at their website. I would have loved to review both of these games (I chose Nature Nuts), it sounds like we would have had fun either way! Thanks for all you do!